Wednesday 11th. March, 2015 – Lots of Fun! Wednesday 25th. June, 2014 – We are getting there! Thursday 12th. June, 2014 – Sailing! Saturday 15th. November, 2014 – They really can’t stay away! 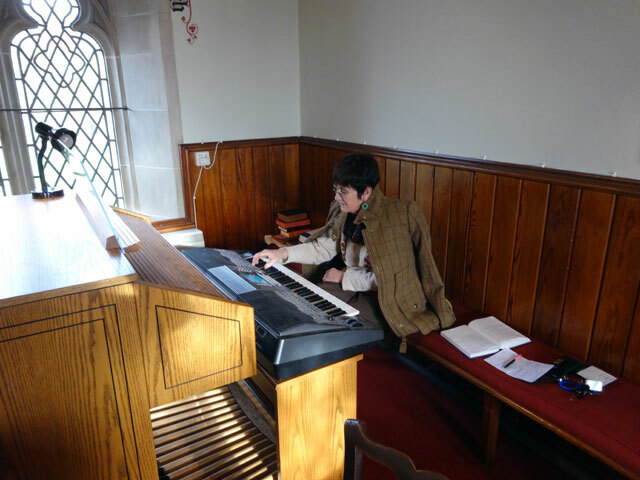 Up, showered, walked Mix, breakfasted, loaded the organ into the car and set off with Rachel and Mum for Gavinton Church where Ann led our worship and preached on the parable of the talents. After the service we joined the rest of the congregation for tea and coffee in the church hall. I crawled home in thick fog – a deer leapt out in front of the car. I managed to stop and was glad that I decided to remain stopped because the deer was followed by another one almost at once. Back home Rachel took the fog as a cue not to drive to Berwick for Evensong. She was very wise. Scott, Sue and Sue’s dad Bill had come to visit and I caught up with them in the farmhouse. On their departure Digger went into Duns to collect fish suppers for our tea. They were very good. Rachel and I settled down in front of the fire and watched an old episode of Vera. I think it was good as well, although to be honest I dozed through the film, waking up in time to catch the News, walk the dog and retire to bed. Another good day.